With 150 million active Pinterest users and travel ranking as one of the top searched items on the platform, those not using Pinterest marketing to showcase their rentals miss out on a big opportunity. In fact, 87 percent of pinners (Pinterest users) have purchased a product because of Pinterest. 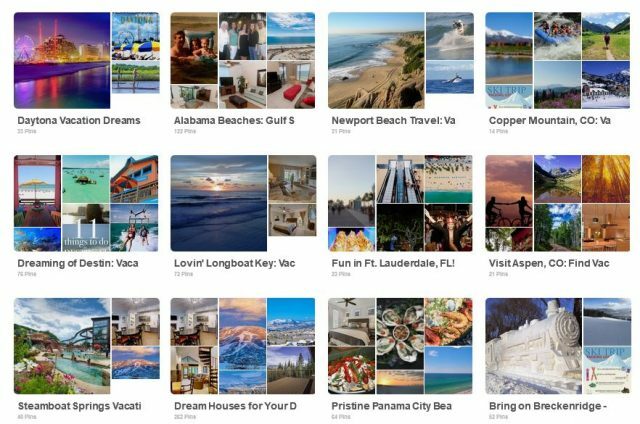 To learn more about this valuable marketing tool, let’s look at Pinterest and how to use it for vacation rental marketing. As of 2016, studies found that 79 percent of Pinterest users were women, and most popular searches target a female audience. Pinterest has become the second-largest social media platform to drive online traffic. Top searches include travel, fashion, recipes, DYI, healthy lifestyles. Pinterest users are planners. They build boards to save ideas for later. Pin relevant content that can serve users for months, even a year. Pins – the images shown on Pinterest – include a website link that drives users to more information. Pins can include one to several images, headlines, quotes and more that visually appeal to users. If the user likes what they see, they then pin (or save) the image to their personal boards. The first step is to create an account for your business. Make sure to include your business name. The description should include an SEO-friendly summary, call to action to your website and phone number. The description does have a max character count, so write a couple of versions and pick your favorite. Don’t forget to mention why your company is the best in the area. Vacation property managers can use Pinterest in two ways. They can create their own boards and pin to them and/or join other boards and pin to those. Social media accounts can take a lot of extra time, so pick one option to start. If you have a few hours a week: Create/pin to your own boards, and also follow other accounts to start building brand awareness and driving traffic. Managers should create multiple boards for one destination or create a board for each destination. Once those are created, follow local chambers of commerce, convention and visitors bureaus, local travel agencies, friends and family, and anyone else in your destination. If you only have a couple of hours a month: Create an account and a couple of boards. Keep it simple and follow other accounts, so you can pin their content. This will help you start building an audience before you have time to create your own pins. When that time arrives, these pinners may share yours in return. The next step is to create pins for your board. Managers with just a few properties can upload pins, create descriptions and add a URL to the property. 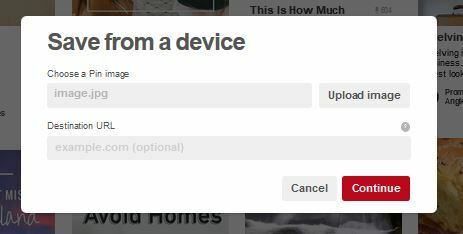 While Pinterest offers a direct option (shown above), users with multiple properties may find applications such as TailWind more effective. For an annual fee, TailWind allows users to schedule pins. This app saves users hours of time. Once installed, a person can sit down for a couple of hours and schedule an entire month of pins. Tailwind users also receive reports, optimization strategies, custom design options and additional Instagram add-ons. Start simple and first pin the vacation rentals. Pick the best photos of the home, and upload it with more information about the rental. Once all of the properties are uploaded, think outside the box. 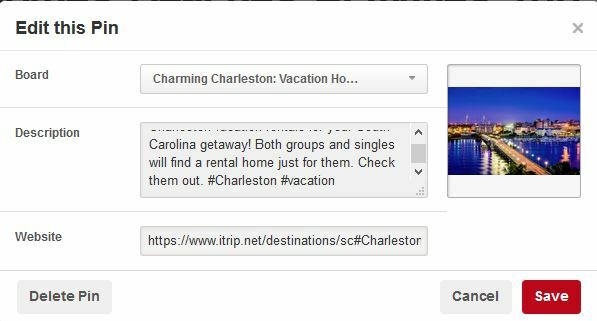 Pinterest marketing for vacation rentals extends well beyond the homes. Upload pins that direct users to blog posts, feature articles, news, sign-ups, contents, videos, and any other content that promotes your brand and website. Each pin should include a detailed description and hashtags. Using hashtags places pins into those categories and increases search visibility. For example, if you use #vacationrental, those searching for that term may find you. Also include a hashtag with your business name, so when someone searches your business, those pins will show. Other hashtags include #<city location>, #<state location>, #familytravel, #travelblog and #vacation. Keep in mind users will not want to see just your account. Pinterest has millions of pins from millions of users that can be pinned to your boards. Pinning other content can fill content holes and help establish the brand as an expert in the field. Look for pins that showcase destinations, things to do, places to eat and other positive vacation experiences. Take it to the next level and engage. One way to engage is invite other Pinterest users to pin to your boards. Look for Realtors in the area, and invite them to join your board. They can post real estate, which may lead to another property to manage. Travel blog writers and entrepreneurs also make valuable contributions and include content that focuses on specific regions, topics and tips. With everyone working together, more content is shared and more brands increase their worldwide exposure. VR Pro Bonus Tip: Always think about your audience. Keep pins relevant to your company and industry. Don’t just pin to gain exposure: Pin with purpose. Watch videos to learn more about the Pinterest platform.